Silky milk texture leaves skin velvety-smooth. The essence of happiness and sunshine. Clarins is at your side. Clarins’ body care range gives you everything you need to see your most beautiful body take shape! Each body cream and product is expertly formulated to deliver the best body solution for your particular area of concern or focus—whether it’s looking fit and firm, becoming an exfoliation buff, or targeting the appearance of cellulite—there is a Clarins’ skin-loving body moisturizer or exfoliator to visibly lift, firm, tone or simply smooth. What’s in your body care tool kit? Body moisturizers visibly minimize the signs of skin aging caused by sun, cold, heating and air conditioning. Intense hydrating body creams smooth dry, rough patches and improve skin tone—gently removing dull, flaky cells for a youthful, all-over glow. Body exfoliators are the ultimate glow-getters! Clarins’ spa-fresh body polishers feel ooh la la luxurious as they contain gentle silica microbeads that benefit the environment as well as smooth away dry cells, flakes, and impurities to reveal your glowing skin beneath. Body contouring luxurious body cream gets skin into great shape three ways: refines, visibly firms and promotes youthful-looking contours for younger looking skin. Body treatment oils with 100% pure plant extracts help visibly firm, tone and improve elasticity, and hydrate by locking in moisture. Aromatic natural botanicals promote an overall feeling of well-being. Bust care helps to enhance and maintain firmness for an immediate “lifting” effect. Bath and shower body care turns every day into a spa holiday with an invigorating cleanser that leaves every inch of your skin soft, clean and beautifully conditioned. The silky lather is gentle enough for the most sensitive skin. Hand care elevates the senses to a total feeling of wellbeing—nourishing and softening rough dry skin on hands, cuticles and around nails, while visibly reducing the appearance of age spots. Clarins’ foot care helps reduce discomfort and fatigue, smooths away roughness, and beautifies nails—renewing and protecting from ankle to toe. Your body coach—in a new luxury size! Body Fit Anti-Cellulite Contouring Expert is based on 60 years of contouring expertise. This innovative body treatment—powered by Quince Leaf extract—helps reduce the look of cellulite with targeted refining and reshaping actions. Clarins Laboratories have pinpointed Quince Leaf extract’s unique ability to visibly smooth, firm and lift. The addictively refreshing cream-gel texture instantly absorbs to soothe and smooth the skin's surface. Clarins’ Body-Smoothing Moisture Milk with Aloe Vera is a scented body milk that helps smooth, protect, and moisture-perfect. This exceptional body cream delivers 48-hour hydration that everybody adores. * Lightweight moisture milk melts right in for soft, supple, velvety-smooth skin. Organic Aloe Vera extract soothes and moisturizes while its refreshing texture leaves skin delicately scented with a gentle whisper of sweet Neroli. 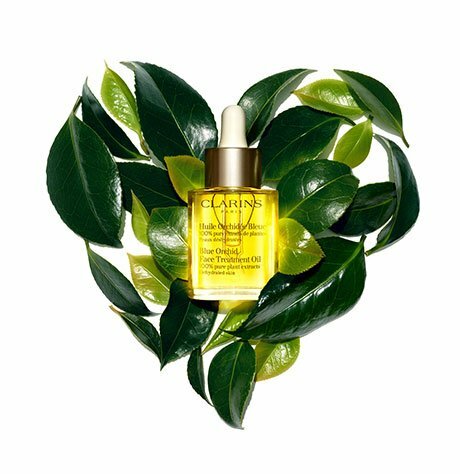 Clarins’ Tonic Body Treatment Oil—with 100% pure plant extracts including Rosemary, Geranium and Mint—helps visibly firm, tone and improve elasticity, reducing the appearance of stretch marks resulting from pregnancy and weight gain. Hazelnut Oil softens, smoothes and hydrates by locking in moisture while aromatic natural botanicals promote an overall feeling of well-being.